NAGA CITY -- Seeking to reduce the amount of air pollution emitted by gas-powered vehicles in violation of emission standards set by the Department of Environment and Natural Resources (DENR), the City Environment and Natural Resources Office’s (ENRO) anti-smoke belching unit patrolled the streets last August 2 to apprehend smoke belching automobiles. The team, which is deputized by the Land Transportation Office (LTO), manned a roadside monitoring and apprehension checkpoint along the Maharlika Highway in Barangay Concepcion Grande and Bagumbayan Norte to conduct emission tests on vehicles through the team’s opacimeter machines for diesel and gasoline-fed engines. The machines, which meet the requirements of the national standard (limits and measurement methods for exhaust smoke from compression ignition engine), and the International Organization for Standardization (ISO), have the capability to continuously appraise the visible pollutants from the exhaust smoke with measured results directly achieved. In the operation, Jayson T. Vargas, City ENRO’s pollution control officer and officer in charge of pollution control and management division, said his group was able to flag down and check 33 vehicles and made to fine 12 units for not passing the test. Assisting the team are personnel from the Naga City Police Office and the Land Transportation Office. The city government which was commended by DENR in past years because of its standing ordinance and relentless campaign against smoke belchers has been up to the task since year 2000. 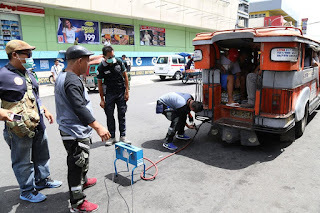 In that year and the following years since ASBU began operating, the city government was able to collect fines amounting to P300,000 from violators of anti-smoke belching provisions of Republic Act 8749, also known as the Clean Air Act. Alexander Caning, ENRO chief, however, said that the primordial concern of the campaign is not to generate income but to compel the motorists to comply with the Clean Air Act. “We should be happier if we got a lower number of violators as this would mean we have a lesser number of contributors to air pollution,” he said.